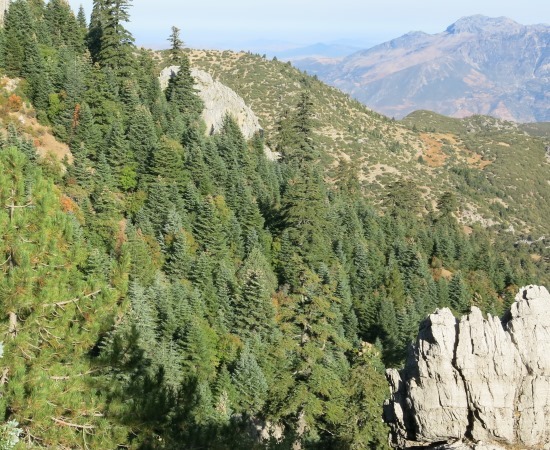 The Moroccan fir is restricted to two small forests in the Rif Mountains of northern Morocco where over a period of 60 years it has suffered a 70% decline. Leaves arranged around the shoot pectinately, those below bent backwards; 1–1.8cm, leathery, stiff, acute (fully exposed leaves); dull grey-green or blue-grey with two broad stomatal bands of grey-green or dull bluish white on each surface. Male pollen-cones crowded along underside of shoot, dark brown, opening cherry-red. 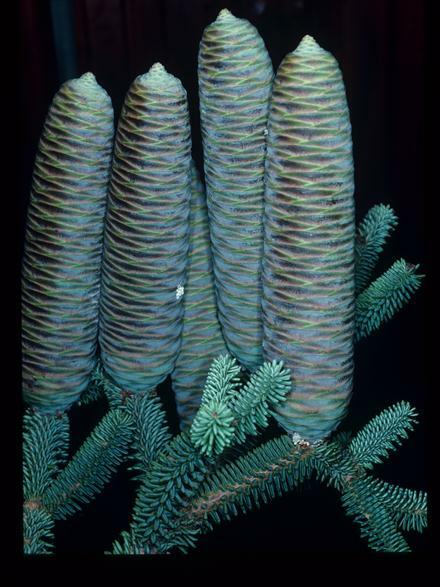 Female seed- cones, 10–18 x 3.5–5cm, abruptly narrowed to apex, greenish purple when immature, ripening dark or light brown. This is one of two varieties, the other being A. pinsapo var. pinsapo (treated on a seperate page), which is native to southern Spain. The differencies between these two varieties is slight; in var. pinsapo the leaves are not arranged around the shoot pectinately but instead are arranged radially and perpendicularly from the shoot; the leaves (fully exposed) are normally obtuse at the apex. 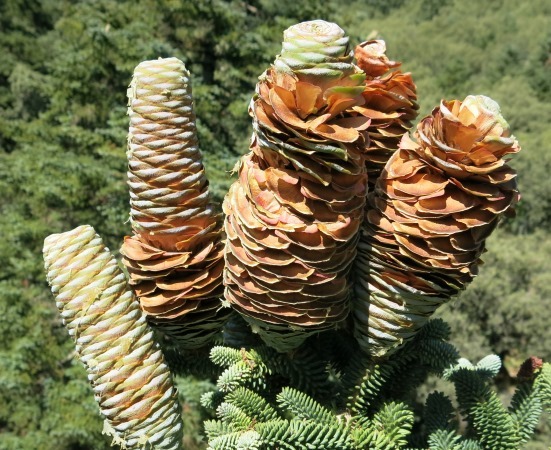 The female cones are much larger, 9–14 x 3–4cm. A. pinsapo var. marocana is sometimes treated as a seperate species (A. marocana Trab.) and the population at Tissouka has been recognised as either A. pinsapo var. tazaotana (Cozar ex Hug. Del Vill.) Pourtet. 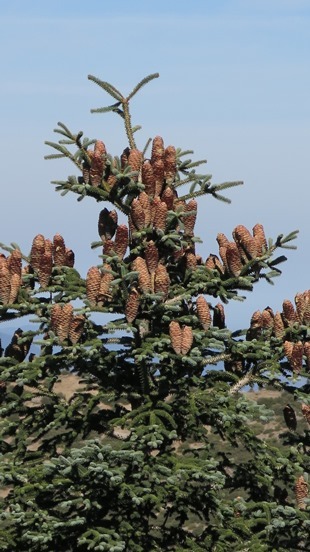 This variety is restricted to a small part of the Rif Mountains in northern Morocco. The main stands are almost contiguous on the mountains of Sfiha Tell, Tissouka, Lakraa, Talassemtane, Bouslimane, Taloussisse, Fahs and Kharbouch. There is also an isolated subpopulation on Mt Tazaot. 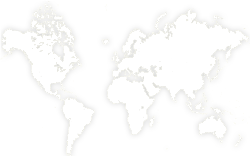 The estimated extent of occurrence is 75km² with an estimated area of occupancy of 28km². Abies pinsapo var. marocana occurs in the Mediterranean humid bioclimatic zone. The average annual rainfall is 1500mm (Benabid, 1983), increasing to 1900mm at an altitude of 1700mm. Stands are typically found on north-facing dolomitic limestone slopes of mountain ridges. 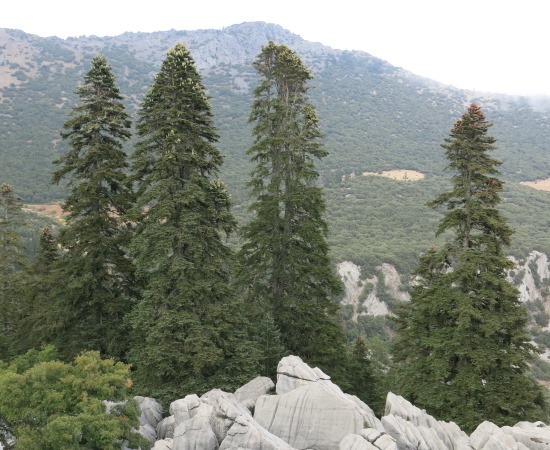 The optimal altitudinal range is between 1400 and 1800m, where the main tree associates are Acer granatense, Quercus faginea, Q. ilex, Q. rotundifolia, Ilex aquifolium and Taxus baccata. Associated ground flora include Hedera marocana, Euphorbia characias, Digitalis purpurea var. maurtanica and Paeonia coriacea. Between 1800 and 2000mm. Abies occurs with Cedrus atlantica, Pinus nigra and Pinus pinaster. Above 2000m the mountain summits are typically dominated by xerophytic species including Berberis hispanica, Bupleurum spinosum and Rosa micrantha, other species include Crataegus laciniata, Rosa micrantha, Rubus ulmifolius and Viburnum tinus. The timber of the Moroccan fir has been used in house construction. Eessential oils obtained from the seeds of this species, are used in Moroccan folk medicine to treat respiratory complaints (Hmamouchi, 1999), the high proportion of limonene recently discovered in the oil means that there is potential interest for the perfumes industry (Based, 2006). 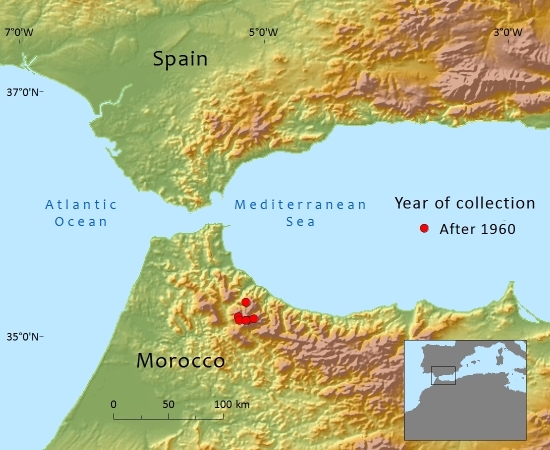 The Moroccan Fir underwent a 70% decline between 1938 and 1994 due to logging, fires and forest clearance associated with an increasing rural population, an expansion of agriculture and the cultivation of cannabis (Emberger, 1938; Boudy, 1951 and DPA, 1994 in Moore et al., 1998). In 1977 most of the forests on Jebel Tazaot was destroyed by fire. A second fire in 2002 damaged part of the remaining forest and there has been little regeneration since then (Esteban, 2010). Although the remaining stands are within a National Park, deforestation associated with cannabis cultivation in the areas surrounding the fir stands remains a problem. While the extent of occurrence (EOO) is less than the 100km² threshold for Critically Endangered, there are two locations and the remaining subpopulations are not severely fragmented. The estimated area of occupancy (AOO) is 28km². 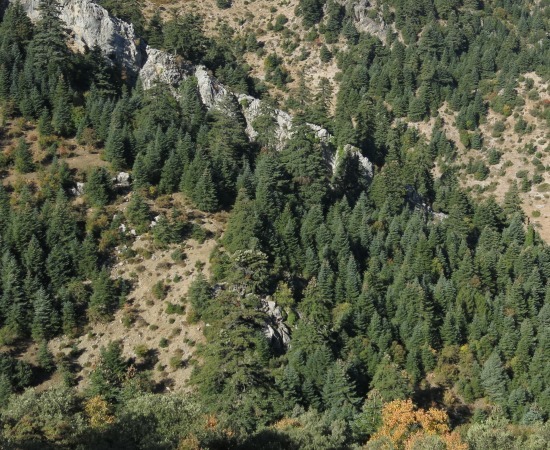 A study conducted by the Moroccan Ministry of Agriculture through the Administration des Eaux et Forêts et Conservation des Sols (AEFCS, 1996) and funded by the Banque Africaine du Développement resulted in the creation of the 60,000ha Talassemtane Natural Park to protect the remaining areas of Moroccan fir (Haut Commmissariat aux Eaux et Forêt et á la Lutte contre la Désertification, 2004). In 2006 Talassemtane Natural Park was included within the first UNESCO Intercontinental Mediterranean Biosphere Reserve. Alaoui, M.L., Knees, S. & Gardner, M. 2011. Abies pinsapo var. marocana. In: IUCN 2012. IUCN Red List of Threatened Species. Version 2012.2. . Downloaded on 07 March 2013. Boudy, P. (1931). Economie forestière nord-africaine. Description forestière du Maroc. 3. Rabat. Direction Provinciale de l'Agriculture (DPA). (1994). Potentialités et développement agricole dans la Province de Chefchaouen. Unpublished internal report. Direction Provinciale de l'Agriculture, Chefchaouen. Emberger, L. (1939). Aperçu général sur la végétation du Maroc. Veröffentlichungen des Geobotanischen Instituts, Eidgenössische technische Hochschule Rübel in Zürich. 14: 40-157. Moore, H. M., Fox, H. R., Harrouni, M. C. & El Alami, A. (1998). Environmental challenges in the Rif mountains, northern Morocco. Environmental Conservation. 25(4): 354-365. Valdés, B., Rejdali, M., Achhal El Kadmiri, A., Jury, S. L. & Montserrat, J. M. (2002). Catalogue des plantes vasculaires du nord du Maroc, incluant des clés d'identification, vol. 1. Consejo Superior de Investigaciones Científicas, Madrid. M.L.Alaoui,S.G.Knees,and M.F.Gardner, 2016. Abies pinsapo var. marocana, from the website, Threatened Conifers of The World (http://threatenedconifers.rbge.org.uk/taxa/details/84).